If you have any questions or want to enquire about dates, use our form to contact Javier Alcántara or see their website for more information. 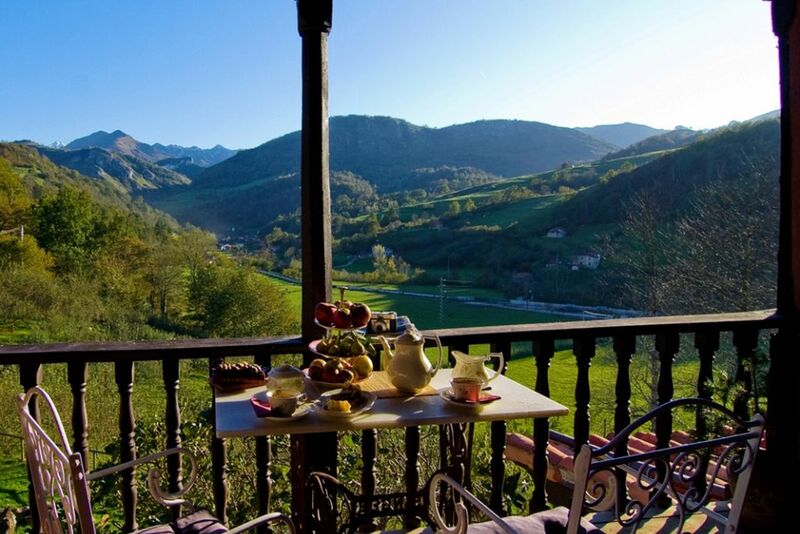 Hugging the side of a valley, in the heart of the Picos de Europa, find a lovely 18th century Casona with glorious views across the peaks. Warm owners Elena and Javier welcome you and make an enormous effort to make their guests comfortable and at ease. What is most striking as you enter the living area is the large terrace looking out over the valley – a wonderful spot to have breakfast or dinner, both made with delicious local produce. Each bedroom has its own terrace too. Breathe in the mountain air, listen to distant cowbells, leave your worries behind. When it’s time to explore, you won’t want for adventures: walking routes through the mountains take you from small cider makers to cheese caves via ancient farms. Javier and Elena have a wealth of local knowledge and are happy to advise: secret swimming spots, stunning canyon treks and organised kayaking. Yoga retreats can be organised too. Dinner from €20. Restaurants 2km. Go go go! The views are stunning, rooms large and comfortably rustic. We were completely new to this area and Javier went out of his way to make sure we discovered the best bits, we visited Covadonga lakes, hiked the breathtaking Ruta del Cares, swam in crystal clear secret river swimming spots (bracing!) and found near empty beaches. Cangas de Onis is a short hop away in the car for shops and restaurants but make sure you eat here at least one night to make the most of Javier's excellent culinary skills! What a bucolic scene. Listening to the cow bells and smelling the climbing jasmine put us in a meditative and restful state. Javier and Elana were the most helpful host eventhough our Spanish and their English was limited. Eating with them in the dining room was a pleasant experience and the restaurant El Molin in Congas de Onis was exceptional. My wife and I would highly recommend this establishment and do plan on a return trip when we travel through northern Spain again. Bustling Cangas de Onis has ample restaurants and shops seven miles west, while a five-minute stroll finds you in Mestas de Con with bars and a basic shop. Once you’ve got climbing, biking, kayaking and horse riding out of your system, there are endless ancient mountain towns and monasteries to explore. 15 miles of winding roads take you to the glacial Lakes of Covadonga surrounded by pasture, while the coast is only 35 minutes away. The Lagos de Covadonga are wonderful natural lakes in the National Park of the Picos de Europa. 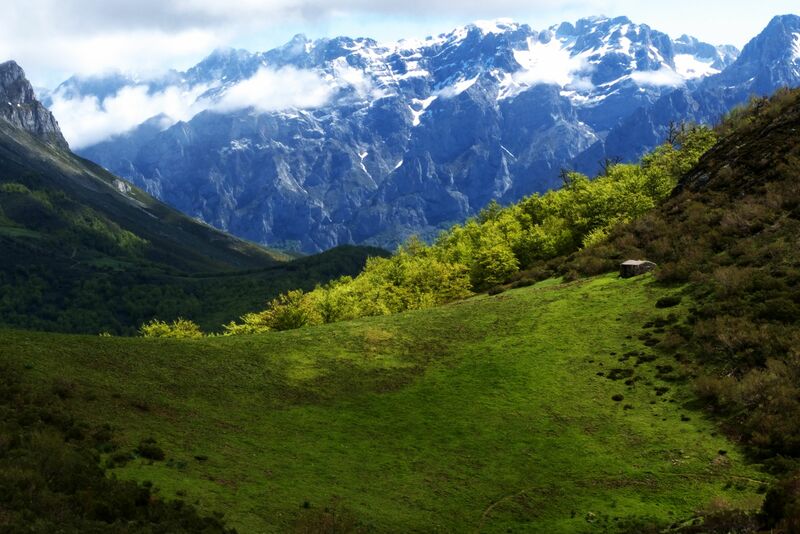 Walk the spectacular mountain path of Ruta del Cares, in the National Park of the Picos de Europa. Close by is the Parque Natural de Ponga, a Biosphere reserve, where the spectacular beech tree forest is one of the largest in Europe. Amazing and beautiful Atlantic beaches of: playa de la Vega, Santa Marina, Torimbia. As well as the picturesque fishing villages Llanes & Ribadesella. Close by is the Rio Dobra, probably the cleanest and most attractive of the rivers of the Picos de Europa, as well as the river Sella which can be descended in a canoe. 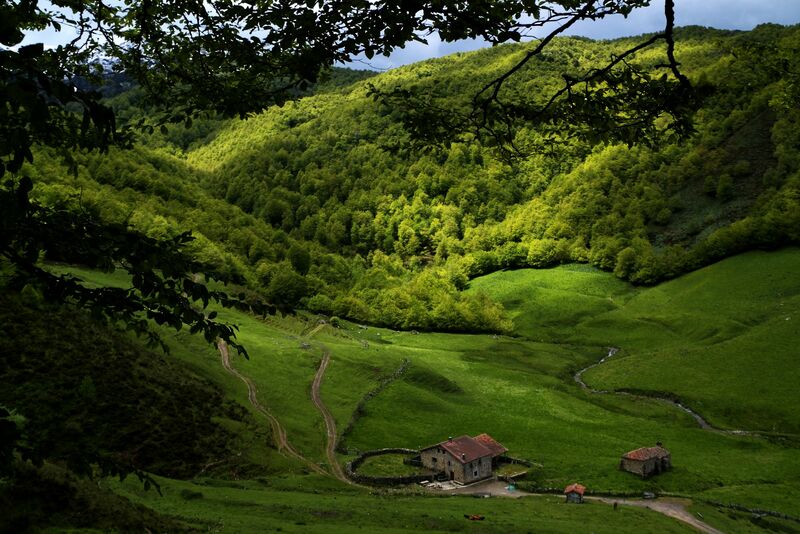 Trekking and walks in the National Park of the Picos de Europa. Javier and Elena left Madrid in 2000 to start their Asturian B&B adventure with just one room. Now, eight rooms and three children later, their love and passion for this area are undiminished. Javier really does go the extra mile to make sure guests have an amazing stay, discussing plans over breakfast, and even searching out maps and lending you walking poles.